“Loma” is the Spanish word for “hill”. “ita” is the diminutive form, i.e. “little hill”. There is a small but prominent hill north of the town center. This station was originally named “Montvale”. 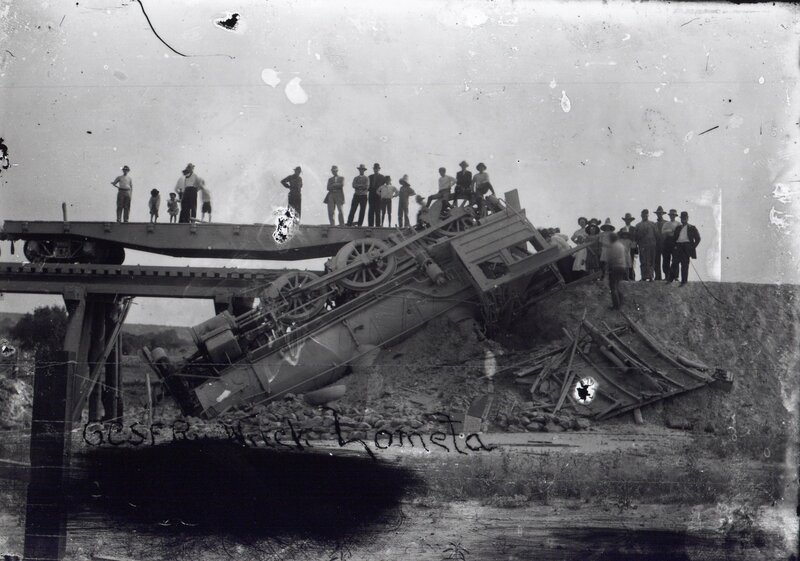 The line from Lampasas to Goldthwaite, through Lometa (then Montvale) was placed in service September 1, 1885. Kelly was paid $104.25 in September for rooming and boarding his crew. “Mrs. Nash” was paid $110.65 in September for their room and board. Note two section crews were based at this station, which was unusual. The payroll ledger indicates that some of these men were paid by remittance directly to Galveston banks, which would seem to indicate they were sent up the line from that point, and their families were paid directly. Section crew laborer names for September of 1886 are available for all stations. For this station, these men were: D. O’Brien, Tom Gillan, Charles Donnelly, Charles Burton, H. Bennett, F. Standridge, John Mahoney, Walter Autrey, James Craney, Tom Farrel, Lee Hanks, Tim Walsh, J. Sullivan, Rube Moore, J. Clifford, William Stewart, James Burns, and Pat Burke. 1921 record shows new depot built 1911, “Standard No. 9”, 24’ by 160.5’, wood frame, drop siding. Built to 1906 GC&SF standard depot blueprints, a 36 page set of drawings of which survives. This depot was later modified by removal of the “white” waiting room from the eastern end. Because it was a junction point with a branch line, the Lometa station had many more structures than most of the similarly remote country points. Structures other than the depot which were listed in the 1921 inventory include a freight platform (32 feet wide, length 83 feet, extended 76 feet in 1921), a cotton platform (25 feet by 84 feet),a stock yard (one chute and one pen, located immediately west of the Potts warehouse), several water closets, coal house, coal bin, several tool houses, oil sump, two Otto water cranes, several water tanks and pump houses, an oil tank, 4 stall engine house, turn table, storehouse, sand house, engineer’s bathhouse, foreman’s office, car knocker’s shed, gate house, coal bin, two section foreman’s houses, and three bunkhouses for the section crew. As was the case for all engine terminals, there were also considerable facilities buried in the ground for the movement and storage of fuel oil and water. At the beginning of the 21st Century there remain few visible traces at Lometa of any of this infrastructure. Three articles, two in 1923 and one in 1933; see index. In 1911 became junction point with 98 mile branch line constructed from Lometa to Eden. See paper presented at 2002 meeting of Edwards Plateau Historical Association for history of this branch line. Railroad Commission authorized discontinuance of agency on September 7, 1982, in Docket 003469ZZAD. Darrell Williams was the last agent, and was interviewed by the author regarding his recollections. Williams is now deceased. Texas State Archives, Railroad Commission Records, Letterpress 4-2/1139, page 325, August 12, 1907. Interesting telegram signed by a group of traveling salesmen, beside themselves with anger, see copy. Because it was a junction point for the branch line to San Saba and Eden, which opened in 1911, this station retained an open agency for almost 100 years. Lometa was an important point for shipments of wool and mohair on the Santa Fe. For this reason, and because of heavy traffic anticipated to be arriving from the San Saba branch line, the new depot built at Lometa in 1911 was one of the largest country depots on the Santa Fe system in Texas. At the beginning of the 21st Century several large wool and mohair warehouses remain along the tracks, and until the 1960s area buyers such as L. M. (“Mick”) Stephens shipped all of their clients’ wool and mohair to Boston on the Santa Fe. Local warehouseman Oran Potts in a tape recorded interview well-remembered the shift of his business from rail boxcars to truck containers. Stephens and Potts were much-beloved pillars of the community, and the Santa Fe extended special courtesies to them. Stephens was allowed to buy and maintain in place the old enginehouse for warehouse storage purposes. It was destroyed by a tornado in the 1990s. The author sold mohair to Oran Potts for 20 years, and rose sadly from the audience at the Lometa Baptist Church to speak at his funeral in the summer of 2003. The author’s great-uncle, Robert Hines, was the Santa Fe’s Livestock Agent at Lometa for much of the first half of the 20th Century. Mrs. Hines (Bertha) taught the first grade at Lometa for decades, and Oran Potts was one of her students. Mick Stephens, reflecting on this coincidence from a vantage point of 90+ years of age when he was interviewed, added a comment that the Lometa schoolhouse was unusual because water falling on the north side of the roof drained to the Brazos River, and on the south side to the Colorado river. As can be seen from the photographic images, the original brick schoolhouse was by far the biggest structure in the community, and prominently visible from the depot as passengers alighted there. It looked more like a college building than an elementary school. “Lampasas County Texas – Its History and Its People” (Wadsworth Publishing Co., Marceline, Mo. 1991) contains a well written article at pages 35-42 on the history of the community, with a discussion of the boom that swelled the town’s population beginning in 1910 as the Santa Fe built its branch line west to Eden from this point. The town was created around the railroad depot in 1885, as the nearby but bypassed community of Senterfitt (check spelling) picked up and moved itself, buildings and all, to the rails. 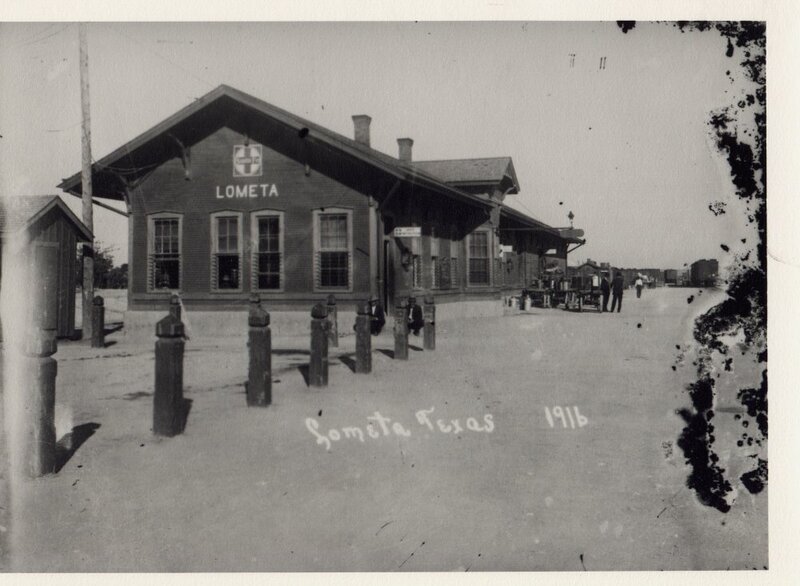 One of the earliest luxuries enabled by the rail connection was something taken entirely for granted today: “Before the days of electricity, ice was brought to Lometa customers by train, first from Temple, later from the ice plant in Lampasas. The ice was quickly transferred to the ice house adjacent to the depot before being delivered from house to house.” (Lampasas County Texas, p. 37). One individual revered from early days at Lometa was Doctor W. D. Biggs. His story is told in a very rare book titled “The Brush of Angel’s Wings, the Story of a Country Doctor” by Roland Windell (Fireside Books, Tyler, Texas, date unknown). The Biggs residence was the most prominent home in the community, and in recent years was moved to a location near Lake Travis by a descendant.